One of the recent advances in our understanding of calcium oxalate urolithiasis has been the recognition of the importance of hyperoxaluria in the pathogenesis of this large and growing problem (Robertson and Nordin 1969; Robertson et al. 1979; Robertson and Peacock 1980; Baggio et al. 1983; Antonacci et al. 1985; Jaeger et al. 1985). It must now be accepted that hyperoxaluria, albeit often mild, is a more important finding than hypercalciuria in many patients and indeed the presence of hypercalciuria should not prevent a thorough search for coexisting hyperoxaluria. 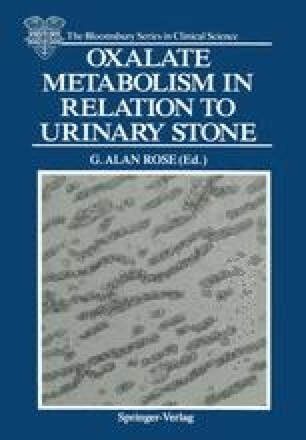 Thus there is clearly a need for urinary oxalate to be estimated in all patients presenting with calcium oxalate stones and those laboratories serving clinics dealing with such patients should anticipate a growing demand for the precise and accurate assay of urinary oxalate.